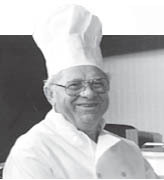 In the early 1960’s Morris Dach, a successful restaurateur for over 20 years, began buying and selling used restaurant equipment from his garage to help friends in the food service business. He loved finding cost-efficient ways to start and expand their businesses and he developed relationships that lasted for decades. In 1966 Morris opened an equipment warehouse store in Columbus, Ohio – offering food service equipment and supplies direct to operators throughout the area. The business venture quickly became successful, and Morris developed trusted relationships with many of the leading manufacturers in the industry, adding a constantly growing inventory of new equipment and supplies to his store. Knowing what his food service operators needed, Morris purchased his products in huge bulk lots rather than simply to fill individual customer orders. Warehousing huge inventories in his “Restaurant Equipper’s Warehouse Store”, Morris eliminated traditional industry lead time, providing immediately available new and used products to the public at BULK PRICES NORMALLY AVAILABLE ONLY TO LARGE CHAINS. As business grew, Morris stubbornly refused pressures to add what he considered to be unnecessary “frills”… including commissioned salesmen, glossy catalogs, route deliveries, design services, and customer credit programs. Instead, Morris hired former food service operators like himself (paying them salaries to HELP customers, rather than commissions to maximize sales), and he developed state-of-the-art warehouse systems, facilities and shipping methods to service his customers more and more efficiently. “Our business is about helping customers save money”, As usual, Morris was right and Restaurant Equippers soon became one of The Largest Restaurant Equipment Warehouse Companies in the Country as well as a highly trusted national mail order supplier efficiently providing low prices to food service operators nationwide. Morris Dach passed away in 2003 and continues to be missed by the company and its customers. However, Restaurant Equippers continues to grow and expand nationally. Restaurant Equippers opened 200,000 square foot distribution center in 2003 to insure items are always in stock for immediate shipment. In 2005 Restaurants Equippers opened an online store, Equippers.com to enable food service operators to shop 24 hours a day seven days a week. Morris’ family continues to run the company, and the Restaurant Equippers team who helped Morris build Restaurant Equippers remains dedicated to efficiently providing more trusted and dependable everyday low prices and special bargains than anyone in the industry. What once was only a handful of food service operators in Columbus, Ohio is now a growing legion of over 100,000 cost-conscious food service operators, benefiting everyday from the principles Morris Dach stubbornly developed in the early 1960’s: Low prices, immediately available products, efficient and friendly customer service, and “no frills”. The spirit of Morris Dach continues to be the cornerstone of Restaurant Equippers’ nationwide growth today. Whether you're purchasing in our Warehouse Stores in Columbus, Detroit, or Greater Philadelphia, on the phone with our Nationwide Order Office (800-235-3325), or online at Equippers.com, we make your shopping experience easy. Restaurant Equippers is a privately owned business serving the food service industryfor over 50 years. We keep prices low by buying in huge lots and eliminating unnecessary frills: no commissioned salespeople or glossy catalogs… no design services… Just food service equipment & supplies at low warehouse prices available for immediate store pickup or delivery. 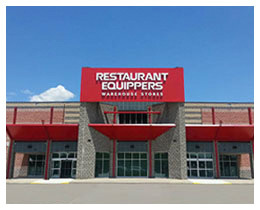 With over 300,000 sq ft of Inventory, a large and experienced staff, and helpful catalog distributed to food service operators nationwide, Restaurant Equippers is one of the largest equipment and supply businesses in the industry, providing fast and trusted service to a growing legion of hundreds of thousands of loyal food service operators. At Restaurant Equippers we provide service to a growing legion of customers who include independent food service operators, large and small restaurant and hotel chains, hospitals, fire stations, public and private school systems, truck stops, diners, pizza shops, food trucks, concessionaires, bars, caterers and chefs, bowling alleys, golf courses, convenience stores, park & recreation centers, nursing homes, and the general public. Many of our customers have been shopping with us for decades. "This is our second order from you. A month or two ago we received 12 barstools from you and we were simply ecstatic about your great service and prices!" "I had an unreliable internet connection, so I just called in my order. Thank you for your assistance. Please pass along my appreciation of the website/live chat option on your website. I love that I can be on 3 phone lines, looking at your products and talking directly with someone at your company. I truly appreciate that convenience." "I got everything and I am impressed with the great service and value. I am very happy and will recommend you to others. Thanks!" "I stopped into the Columbus store for the first time and I was taken aback by the fantastic customer service – from the front door all the way to the loading dock. I bought a freezer and everyone was so helpful. It was a great experience. I will be back to buy my cooler. AAA++++"
"I am writing this letter to express my appreciation for the professionalism of your team in servicing me during the purchase and particularly the delivery of equipment I purchased from your business this month. First of all, your salesperson Lisa was most resourceful in assisting me and my partner...She took the time and answered our questions. She researched to make sure we were getting the right product for the intended use. ... Your staff and service have solidified me as an on-going customer. Thank you very much." "Your staff has exceeded my expectations in this business. The process of ordering, shipping, and returns has all been excellent. I will certainly recommend your company to many other business owners." "Your salespeople were extremely helpful, knowledgeable about the equipment, and went out of their way to help me define my needs for a specific project I am working on." "I commend you for having such highly motivated, efficient, and customer-oriented people on your staff. I am a new customer. After a 2 ½ hour drive in 96-degree heat, I had the pleasant surprise when I arrived at your store. The sales person who helped us was pleasant, efficient, and a great guide to your products. [Minutes later], all of our items were waiting on the loading dock for us. I was in the corporate world for a long time as an executive with over 135 administrative assistants reporting to my organization; I would have been proud and fortunate to have your sales person on my staff. She made me feel as if I were the most important person she had helped all day. I will definitely be a long-time customer of yours… and I also plan to tell others about your fine company. We'd love to hear from you about your experience with us at our Warehouse Store, on the phone with our Nationwide Order Center, or online at Equippers.com!